Transfer from Kilimanjaro International Airport to Marangu Hotel for dinner and overnight. Marangu Hotel is on the slopes of Kilimanjaro and is situated in the midst of twelve acres of gardens filled with trees and flowering shrubs. It offers scenic views of the surrounding villages and Mount Kilimanjaro. After breakfast, go to the national park for a day hike. Pass through the lush tropical rain forest enjoying the sounds of primates and birds. Identify the numerous species of trees and plants that thrive in the diverse environment. Eat a picnic lunch in the national park. Return to Marangu Hotel for dinner and overnight. Relax in your private cottage or at the bar or lounge. After a leisurely breakfast, leave the Marangu Hotel for Uru waterfalls, which lie about thirty minutes outside of Moshi town. The 50 meter waterfalls is one of the hidden treasures of Kilimanjaro Region and offers tourists the opportunity to hike through coffee farms and enjoy a spectacular view. Enjoy a delicious picnic lunch at the base of the waterfall. Depart Moshi at seven o'clock after breakfast and drive to Serengeti National Park. Leave early in the morning to allow for an afternoon arrival. Eat a picnic lunch in the bush and view exciting animals along the way. Serengeti National Park, which has been declared a World Heritage Site and Biosphere Reserve, is a vast and beautiful expanse of 5,600 square miles which supports the largest concentration of plains game in the world. Famous for its gregarious procession of millions of wildebeest and zebra that takes place from December to August, the Serengeti attracts thousands of visitors each year. The migration offers excellent opportunities to view animal behavior due to the abundance of both predators and prey. Common animals are wildebeest, cheetah, zebra, lion, giraffe, and different species of antelopes. Spend the night at Ikoma Bush Camp, a secluded, luxurious tented camp on the outskirts of the Serengeti. Ikoma provides private accommodations for up to twenty people; each tent is in its own secluded area surrounded by vegetation. At Ikoma, we will go on a night game drive. During the drive, use a flashlight to spot the eyes of Serengeti animals. If lucky, we may catch a big cat hunting. Day five is devoted to Serengeti National Park, filled with game drives and visits to less well-traveled areas of the Serengeti. The Serengeti region encompasses Serengeti National Park itself, the Ngorongoro Conservation Area, Maswa Game Reserve, the Loliondo, Grumeti and Ikorongo Controlled Areas and the Maasai Mara National Reserve in Kenya. View animals such as hippo, cape buffalo, giraffe, cheetah and lion. Return to Ikoma for a hot lunch, relax for a little while, and then continue on with another game drive in the afternoon. After the afternoon game drive we will proceed to Serengeti Serena Lodge for dinner and overnight. This Serena Lodge is designed to resemble traditional Maasai bomas. Each bungalow has a spectacular view of the Serengeti Plains. Relax outside or in your room while listening to the sounds of Africa. On day six, we will try to find the giant crocodiles that await wildebeest in Grumet River. We will continue with a game drive close to the river and then eat a picnic lunch in the bush. Spend all afternoon on a game drive, returning to the Serena Lodge for dinner and overnight. Spend the morning viewing game in the Serengeti. After lunch we will leave the Serengeti to make our way to Ngorongoro Crater, stopping by Olduvai Gorge along the way. We will visit the museum at the famous archaeological site and learn about the history of the area. We will arrive at Ngorongoro in time to view the spectacular crater sunset. Eat a superb dinner at the Serena Lodge while relaxing in the comfortable atmosphere of the lodge. Day Eight: Ngorongoro Crater A full day in the world-renowned Crater awaits. After descending 2000 feet, you'll view the various resident animals on the crater floor. The largest unbroken caldera in the world, Ngorongoro has an area of 260 kilometers and a depth of 610 meters. Created when the cone of an extinct volcano collapsed, the crater provides a protected habitat for thousands of mammals and birds. The entire day is spent on the crater floor viewing lion, hyena, wildebeest, zebra, black rhinoceros, and many species of small antelopes. During some seasons, the soda lake is crowded with flamingo and other water birds. You may also see Maasai herdsmen grazing their cattle in the crater. Enjoy your picnic lunch at the designated lunch spot where Black Kites feed on tourists' leftovers. Lunch offers an excellent opportunity to view the behavior of birds and observe the forest elephants that usually feed in the marsh near the picnic area. After lunch, you will continue on a game drive to spot the most elusive of the Big Five, rhinoceros and leopard. 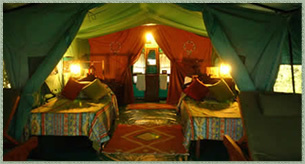 Leave Ngorogoro Crater around 4pm to return to Ngorongoro Serena Lodge for a relaxing evening. Leave Ngorongoro after a leisurely breakfast to drive back to Arusha. On the way back, we will stop at local markets and curio shops will promise a glimpse into village life and also offer an opportunity to purchase souvenirs. After reaching Arusha, Buffalo Tours Safari staff will assist you with your next travel plans. Spend the night at the Impala Hotel, located in the center of Arusha town. Explore the town or relax in the hotel. Arrive at Arusha Airport in time for the eleven o'clock morning flight to Zanzibar. After reaching Zanzibar, proceed to Breezes Beach Hotel for a beautiful afternoon and evening on the coast of Zanzibar. Enjoy the sunset while eating a delicious meal. Spend all day on the beach or explore different areas of Zanzibar. The Breezes Beach staff will assist you with planning your visits to the different attractions in Zanzibar. Visit Jozani Forest Reserve, the only remaining natural forest in Zanzibar. The forest is home to much of Zanzibar's wildlife including the endemic red colobus monkey. Spend an hour watching the monkeys as they play among the trees. Overnight at Breezes Beach Hotel. Spend another day in Zanzibar. Take boat trips to surrounding areas including Chumba and Prison Islands. Chumba Island is virtually uninhabited and offers some excellent snorkeling. Watch colorful lionfish swim below as you swim around the reef. Return to the Breezes Beach Hotel to eat a delicious seafood dinner. The main attractions of Prison Island are the giant tortoises and the ruins that were once part of the Arab slave trade. It also offers beautiful views of Zanzibar town. Arrange special trips with the hotel staff to other beaches or Stone town. The narrow streets of Stone town offer many opportunities to experience Swahili culture. Arrange a town tour, learning about the history of Zanzibar. You can also go on a spice tour where you will learn about the spice trade and cultivation methods used on Zanzibar. Spend a final day soaking in the tropical sun. Relax at the hotel or explore other areas of the island. Leave Zanzibar on the eleven o'clock morning flight to Arusha. Visit shops in Arusha before proceeding to Kilimanjaro International Airport for your flight back home.